Posted February 27, 2015 by Monica Magnetti & filed under Achieve Goals, Business Tips, Motivational Quotes, Personal Life and Business Life, Trust Yourself, Well-Being, Work Life Balance Tips. It’s the Year of the Goat, and let me tell you, we’ll never find a better teacher, to help you leaping to your goals. The Goat, in the twelve-year cycle of the Chinese Zodiac, will guide us according to traditional wisdom to a better understanding of ourselves. I have proof of this. When I was growing up in Italy, our family was given a goat as a gift. Now, I don’t know who would give us such a fragile gift, considering our giant dog, Rocky. Rocky’s reputation was as black as his coat. He was a guard dog, and though he was affectionate and gentle with all of us children, with others he could be vicious. The goat, named Goatee, was adorable, with wide brown eyes and a patchwork coat white and brown. We children couldn’t stop petting him. For his safety, he was fenced in an area of our big garden, and this became his new home. The noise began almost immediately. Goatee had the loudest baa I’d ever heard, and he wouldn’t stop. All I could hear from the moment I got home from school was his bleating. It didn’t matter if he had company or was fed and watered, the racket just went on and on. It seemed he couldn’t get enough of his own voice. Of course, everyone was irritated, but no one more than Rocky. Rocky’s purpose in life was, after all, to destroy intruders. Goatee was moved further and further away from the house, yet his bleating continued unabated. After a week of this, we were all on edge. I remember walking over to Goatee, safely behind his protective fence, followed by Rocky. As I tried to soothe Goatee with calming words, Rocky decided he had had enough and jumped the fence. I was speechless. Rocky charged Goatee, who took off at a speed I wouldn’t have thought possible. Goatee’s agility amazed me, especially his ability to change course in an instant. He would run straight ahead, then deke right or left, then leap up onto a rock. And even with all this physical exertion, his bleating did not for a moment let up. Truth was, Goatee was unfazed. He knew how to take care of himself. He always knew where Rocky was and could strategize while running for his life. This goat knew how to stay alive. This story had a happy ending for everyone. Goatee, through his own efforts, remained safe. Rocky got tired and went off to rest. And I learned priceless lessons from my goat and my dog. Here are 5 valuable tips, courtesy of Goatee. 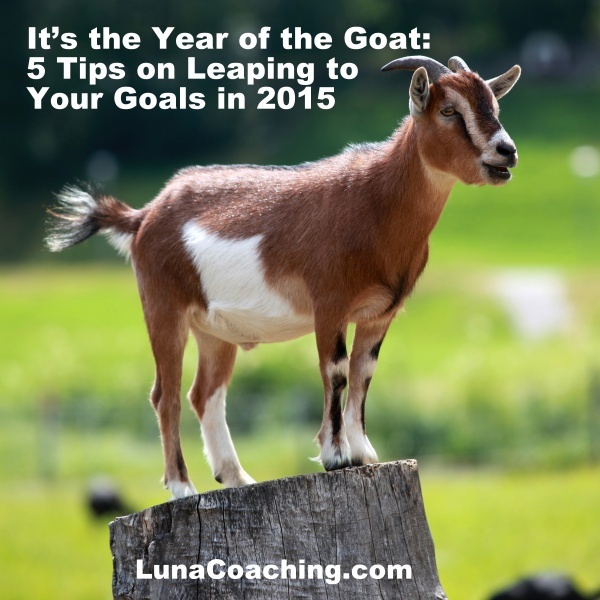 Apply these tips to your personal and business life, and you, too, will leap to your goals. Make sure you are noticed. When you are in a new environment, show your most outstanding and authentic qualities and convince the world you are there to stay. Get fit, both mentally and physically. To strategize you need stamina. Agility is not just physical, it’s mental too. Challenge your brain and always hold yourself accountable. Be unpredictable. Shift and change direction without warning. This will keep others on their toes. Use the element of surprise to your advantage. Know your pursuer’s strengths and weaknesses and be ready with your strategy. Rising to the top is not about building yourself up. It’s about knowing who you are in the face of your surroundings and your enemies. Know when to stop. Once you have shown the competition what you’re made of, be gracious and stay within your fence. Remember Goatee. He was both a team player and a strong individualist. Ask yourself: How can I apply these tips to my advantage? What other lessons does the Goat have to teach me? Then, stay tuned for 2018, the Year of the Dog, when I share the lessons I learned from Rocky! PS Rocky and Goatee found ways to get along. They both took a look at themselves, and while remaining authentic, learned a little flexibility. Monica Magnetti is a Life/Business Coach and Brand Expert. She supports her clients while they leap to their goals and get what they want. Download her free eBooks to establish your brand.